From the Finding Nemo-esque logo and the bulbous eyes of the sharks, you might get the impression this is a family-friendly romp where you munch through the ocean like a sea-faring Pac-Man, accruing points and combos as you go. 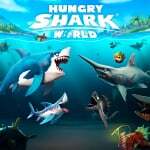 Which is pretty accurate, apart from the ‘family-friendly’ bit – Hungry Shark World is gleefully, ridiculously blood-thirsty. 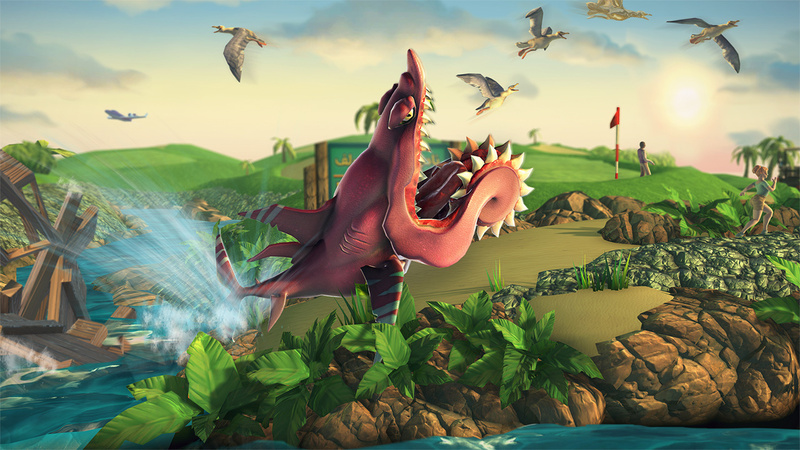 This side-on gobbler is the latest in a successful mobile series from Ubisoft studio Future Games Of London. Originally released in 2016, it’s been reworked for consoles to remove microtransactions with an XP system. This works well enough, although it takes longer than you might expect to get to the newer environments. Your goal is to survive as long as possible, complete missions and score points to unlock bigger, badder sharks and move around the globe to four different feeding grounds. Controls are simple – the left stick moves your shark and ‘ZR’ activates a brief speed boost linked to a meter that recharges after a few seconds. A life meter steadily depletes when you’re not devouring marine life, forcing you to eat continuously. Swimming into smaller fish is enough to ingest them, but larger prey – such as harpoon-throwing divers, dolphins and even other sharks – require a little more mastication, activated with ‘ZL’. Movement feels somewhat imprecise at the beginning and we occasionally wished we could zoom out a tad to get a better view of the surroundings – it can be difficult to make out your position when things get busy. The touchscreen would have been useful on menus, but at the time of writing, there’s zero touch support on Switch – strange considering the game’s smartphone origins. It’s hardly a visual showcase either, but environments look pleasant enough. You’ll find the ocean teeming with life, human and otherwise. There’s a whole host of collectables, from treasure chests and maps to floating letters and fossils. Hitting ‘Y’ brings up a map with important locations highlighted and a list of missions for your current shark – each one has ten to complete. 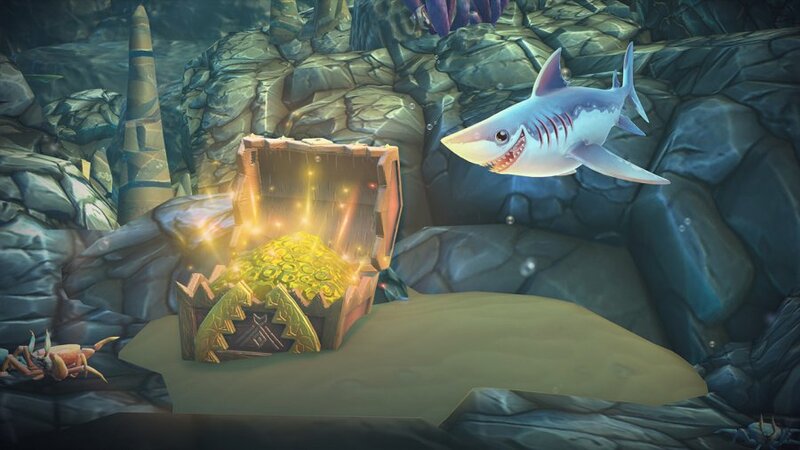 These vary from things like ‘Survive for four minutes wearing a pirate cravat’ to ‘Eat 30 dolphins in a single swim.’ Fulfilling these requirements unlocks more accessories for purchase and new, larger sharks which can destroy underwater barriers enabling you to explore further. Upon selecting our starter porbeagle (nearly all the sharks are based on real-world fish, although the realism stops there), we dived in, immediately encountered an idle bather and started gnawing on him. It took a while but soon a cloud of blood appeared as he wailed “I don’t wanna die!” in a cod-Australian accent and we shot off for our next meal. Soon we were purchasing comedy moustaches, clown noses and hula skirts using in-game gold and recruiting baby sharks to accompany us on our deadly sprees. All this gear comes with perks giving percentage increases to speed, bite radius and other stats. But why stop at the ocean when there’s a veritable buffet of delights to devour above the surface as well? Nowhere is safe from your mindless eating machine and the developer doubles down on the game’s glorious absurdity in the name of score-chasing fun. A meter gradually fills as you eat, eventually initiating a Gold Rush that turns tough, chewy prey to butter and earns you big points. Every so often a Mega Gold Rush will trigger, enabling you to scoff down entire whales in mere moments. Keep going and you’ll turn giant and eat everything on screen. Fun as it is, optimisation problems spoil the experience. Load times are lengthy – over 40 seconds from menu to gameplay. More egregiously, upon death you’re sent back to the main menu via another loading screen – 15 seconds this time. Instant retries aren’t available which, for a quick-fire score-chasing game, utterly destroys your momentum. Unfortunately, technical issues don’t stop there. We experienced several crashes throughout our review. This is obviously infuriating when you’re in the middle of chasing a big score and again it highlights not only the crippling load times, but also the repetitive nature of the gameplay. When you’re in the middle of a feeding frenzy, each multiplier is enough of a dopamine hit to keep you playing, but being pushed out to the Switch’s main menu makes you wonder if ‘just-one-more’ is worth it. The obvious optimisation issues with the port are disappointing – Switch should handle this with no problems whatsoever. If you find Ecco the Dolphin a bit dull, Hungry Shark World is an ideal antidote – what it lacks in finesse it makes up for with vicious energy. The gated content is doled out a little slowly, but the base gameplay is fast and satisfying, if a little repetitive. However, it's the interminable loading screens that truly destroy the pace and hamper the arcade-style fun, making this one hard to recommend. 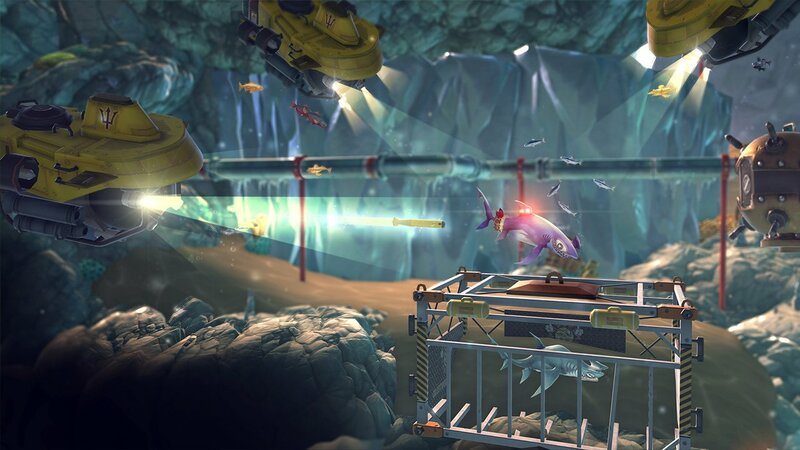 As the review mentions, the game has a tendency to crash and loading times are indeed too long for a game that is all about short bursts (a typical run will last around 4 to 8 minutes). Still enjoying my time with it, but I'm playing it with somebody else next to me, taking turns, which makes the loading times bearable. Played on Android, cool game, with physical controlls even better - buy it . 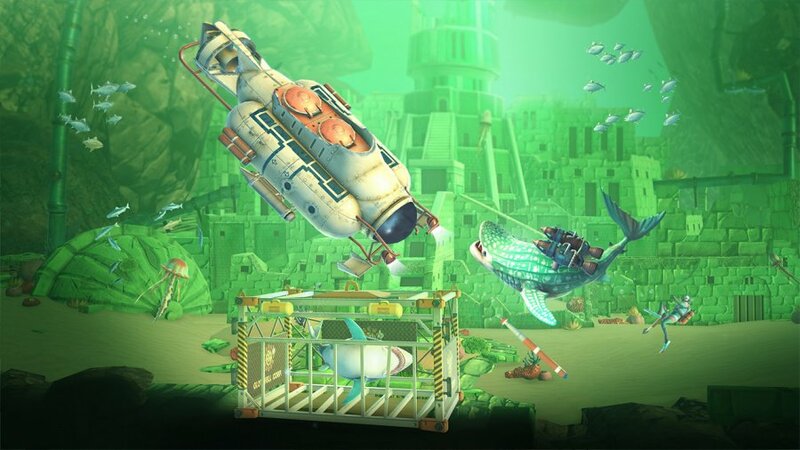 I've been waiting 20 years for a fun, arcade shark simulator and it seems I will have to wait a bit longer, unless the game gets nicely patched before going on sale. Shark! Shark! on Mattell Intellivision is still the best Shark game! Looks like a lot of fun, even if brainless. Too bad about the loading times. Optimizing graphics like these can take some effort. Great. Now we just need Sharknado: The Video Game and we're all set. This actually looks kind of fun if they fix the loading and crashing problems. Exactly what I thought it would get and the reason why I said it’s not worth $10 when it’s free on mobile. My kids are so excited for this game but if it's going to crash on them, I don't think I'll bother. If Ubisoft fix it then they can have my money. I really love this game!when I haven't got hours to spare on Xenoblade Chronicles 2 and Stardew Valley I can rely on this to give me tons of fun in short bursts. Apart from the loading times which I agree are ridiculously long at times I have had no problems with crashes at all and to be honest think that score is a little unfair. @Anguspuss - You're right about it being a mobile game, but even I cannot say it was as bad as you say for being said mobile game. In fact, the only general junk about it was the controls BECAUSE it was on mobile. If this game got on consoles first I cannot say the reception would been the same. 5 is a fair rating for a game like this, though. Maybe a 6 if you're into the type of game. The price is less than most fast food meals, which may be rated worse than this. I agree 100% with the review, this simple yet addictive game is not very satisfying to play with the long loading times. With the huge grind before you get a bigger and better shark, the loading should be near instantaneous. The crashes and the extremely long loading times moved this game into the "wait for a patch/sale" bin for me. Sad, because I wanted to spend my money on this to show that charging a flat fee instead of continuous microtransactions is the right thing to do on a console (leave the f2p or freemium cr4p on mobiles please, I didn't bought a Switch for that). Ubisoft should do Far Cry 3, Assassin's Creed IV or Rogue are good games and would look good on the switch screen. I think this game is deserving of a better score than 5 ..
@Jhon29RD Steep is definitely vaporware, it is like those Wii U games that never got cancelled but are most definitely never releasing. Long load times and no touch control, from a direct port of a cell phone game? Oh hell no. If you’re going to sell us garbage, at least take the stink away. I played this on mobile. I thought the gameplay was a little different to what I had imagined from the trailer. And I thought the world would be more exciting and adventurous. I was completely wrong. Everything was over the top on graphics and eating mechanics.